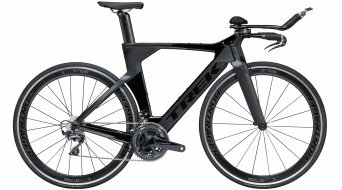 What makes a triathlon bike and/or a time trial bike? A triathlon bike, but also a time trial bike, is a (very) specially developed type of bike. At first glance, they look a lot alike. The goal of both bikes is to have as little aerodynamic resistance as possible. That is why special frames are being manufactured. Even the fork, brakes, wheels, seat posts, seats, build-up... just everything is tested in the wind tunnel and especially modified in order to achieve this goal. 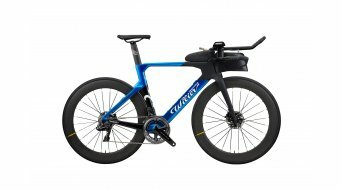 The bike giant, the company Specialized, advances even more with the Shiv and has integrated a drinking reservoir in the frame of its triathlon model. The weight is not the deciding factor, neither for triathlon nor for time trial bikes. Everything is subordinated to the streamline shape. Which differences separate those two? The sitting angle of the triathlon bike for example is a bit steeper. At triathlon bikes intended for competitions, the top unit of the handle bar is not allowed to be open in front and the bike must not exceed 2 metres in length according to the guidelines of the DTU (German Triathlon Union). A time trial machine in competitions must abide by even stronger limits imposed by the UCI (Union Cycliste Internationale). At bikes for time trials, it must be observed that the ration 1/3 in terms of the width/length of the seat post is not exceeded. Furthermore, a minimum weight of 6.8 kg applies to time trial bikes according to the UCI statutes. At both bike types, the seat post angle is steep and the chainstays are short in order for the thighs not to touch the upper body. The handlebars with top unit are designed so that you can take a stretched position (of course aerodynamically speaking) and that you'll also clearly sit further towards the front. An excess of the seat to handlebar ratio amounts to at least 10 cm. Even the gearshift is mounted at the end of the aero top unit in order to enable you to stay in the lying position. For the wheels, mostly high profile rims with 80 mm construction height are being used or even a disc wheel in the back. Now, it's high time to discover our offer from top brands, such as Cervélo, Specialized or Trek. Here, online in our shop for triathlon & time trial bikes. We are your expert dealer with favourable prices and worldwide shipping.